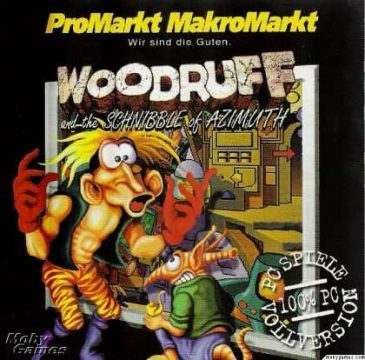 The Bizarre Adventures of Woodruff and the Schnibble is often lumped in together with Coktel’s Gobliiins series, although it’s actually an entirely different game. 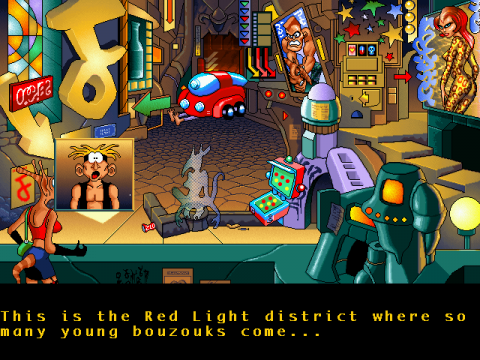 It’s easy to make the mistake – the distinctive artwork in both was done by Pierre Gilhodes – but while Gobliiins deemphasized narrative and exploration in favor of pure puzzle solving, Woodruff is more of a traditional adventure game, with a fairly large, open-ended world, and quite a bit of dialogue. It is not Coktel’s only adventure game of this type, but most of these were viewed from the first person perspective (Fascination, Lost in Time, Ween: The Prophecy) while Woodruff is third person. The story begins on a post-apocalyptic Earth where the human race has been forced deep into the planet’s crust to hide from the nuclear fallout. After several centuries they emerge to discover a new race of mutants called Boozooks (also spelled “Bouzouks” in the subtitles). While friendly, humanity’s first instinct is to wage war on them, and thus completely destroy most of their civilization. 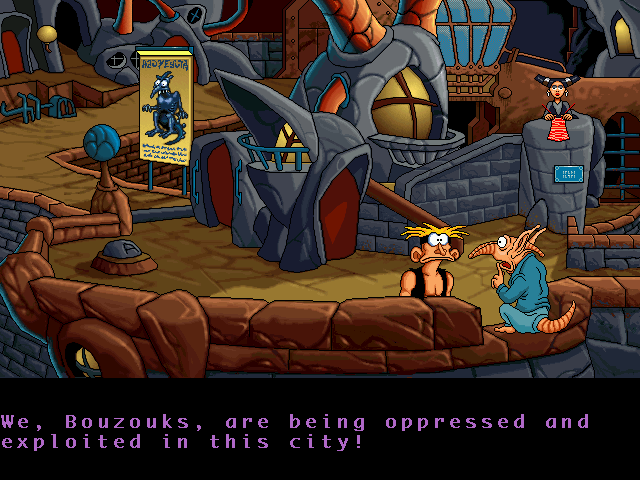 They are enslaved and forced to build an enormous city called Vlurxtrznbnaxl. The ruling human class lives closest to the sky, while the subjugated Boozooks are forced to dwell in the ghettos closest to the ground. Boozook cause. He is sought out and captured by Bigwig, the advisor to the human president, leaving behind the professor’s young son Woodruff. 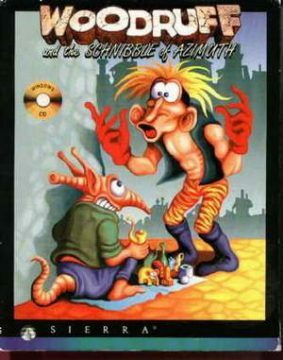 Through one of the professor’s strange devices, Woodruff instantaneously grows into adulthood and attempts to not only track down his father, but discover the mystical Christ-like entity known as the Schnibble, who is prophesized to not only save the oppressed Boozooks but also bring peace and harmony to the two civilizations. 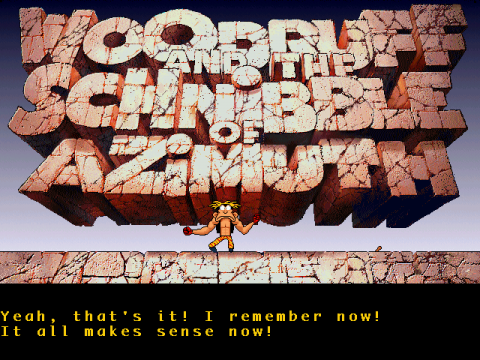 That’s pretty heavy stuff, and indeed Woodruff and the Schnibble seems remarkably dark at the outset. But at heart, it’s still closely related to the Gobliiins series in style. 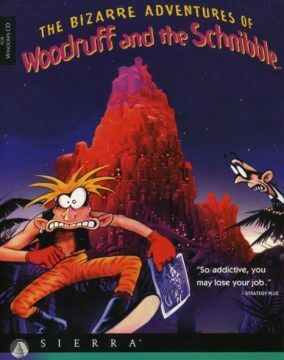 They’re both extremely silly, although in different ways – while Gobliiins found most of its humor with cartoony slapstick, Woodruff surpasses all of that and falls chaotically into Dadaist absurdity. actually mean. When Woodruff solves a simple puzzle and finds something called a tobozon, it cuts away to a human, presumably one of the game’s artists, who muses “What’s a tobozon?” (It’s a fancy videophone, you quickly learn.) 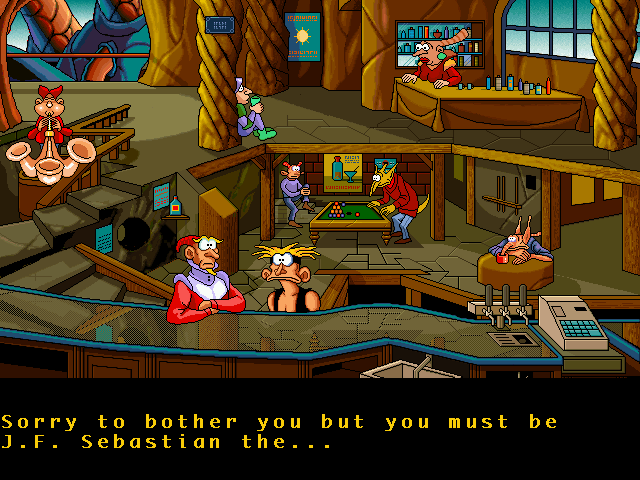 One minor character (J. F. Sebastian) is inexplicably named after a character from Blade Runner. The man at the betting house delivers every line like a Catholic sermon. Rather than betting on typical fights or horse races, you bet on a pair of colored monsters who compete in exceptionally expedient games of chess. 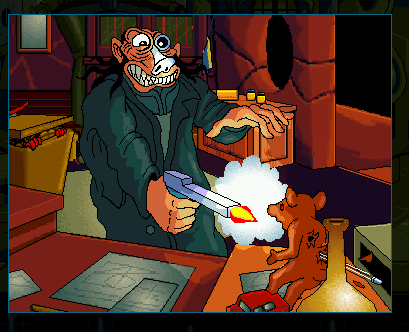 The intro features a prolonged scene where Bigwig sadistically riddles Woodruff’s poor teddy bear with bullets. 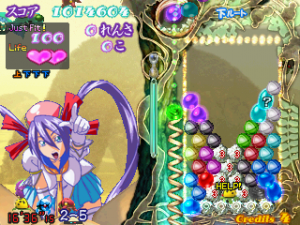 The title screen is its own in-game room – part of its logo even breaks off and becomes a usable item. The man on the weather channel is constantly cracking up despite not saying anything at all funny. Bigwig (perhaps unintentionally) looks like a cross between the Terminator and Richard Nixon. When a tabloid indicates that Bigwig is dating the gorgeous Coh-Cutt, whom Woodruff had developed a crush on not moments before, he collapses on a nearby bench, dejected, and refuses to move until you can show him the right items to cheer him up. Most conversations are brief, and there are large chunks of dialogue which lack context and don’t seem to make a whole lot of sense. 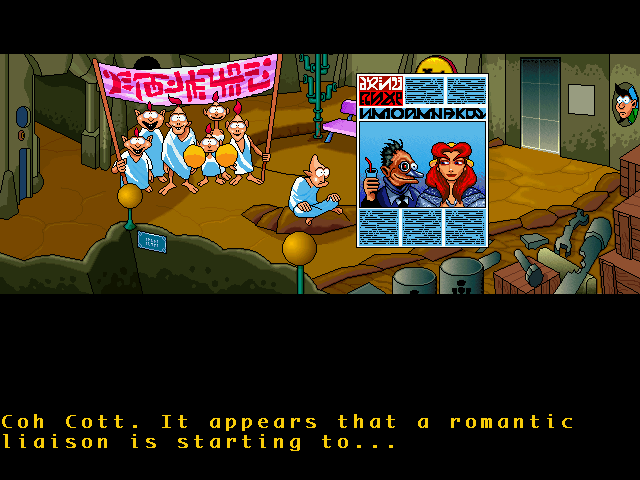 Some of this may have to do with translation issues, although the quality of the English voice acting is surprisingly decent, as the actors can somehow sell each and every perplexing line. 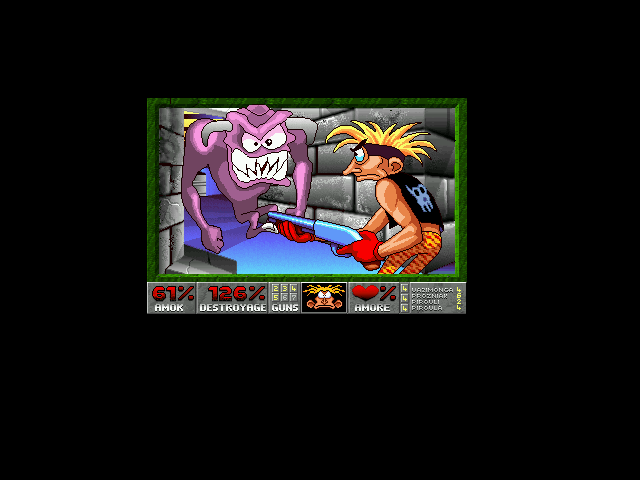 The puzzles in Coktel games were often absurd, but since they were also pretty linear, most could eventually be figured out by trial and error. 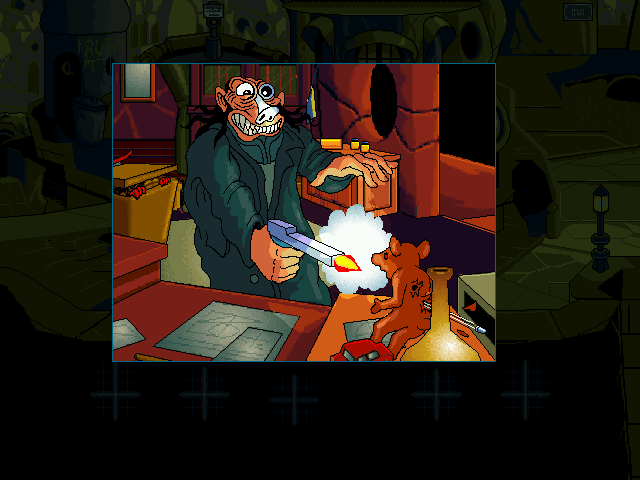 Woodruff and the Schnibble, on the other hand, is far more open-ended, and there’s no real direction in the beginning. There are well over forty locations, which take a long time to traverse until you get the transporter. There are also dozens of inventory items, some of which spawn their own sub inventories. 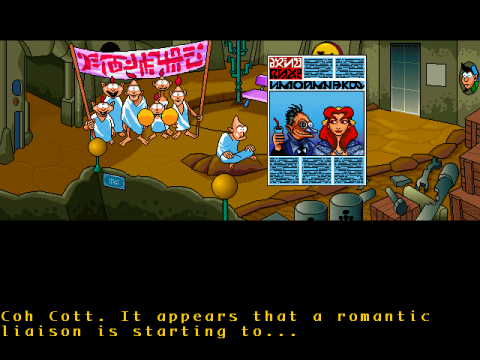 The puzzles are technically a bit easier than anything found in Gobliiins, mostly because you only control a single character, but there are still plenty of opportunities to get incredibly stuck. It doesn’t help that Woodruff never actually explains why your actions won’t work – he just makes goofy expressions that indicate that you’ve failed. 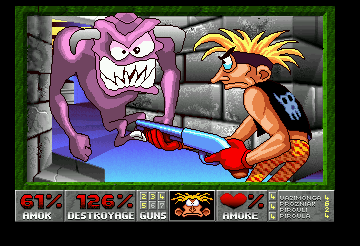 This is a trademark of Coktel’s work, but rarely has it been this frustrating. 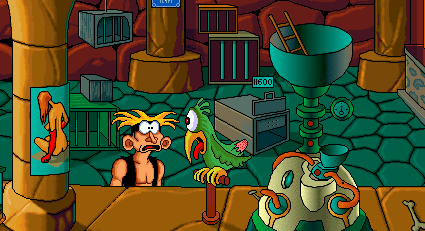 A good chunk of the adventure is spent reuniting the Boozook council, who have devolved into brain-addled fools and lazy do-nothings. (The King seems content to sit around all day, watching TV and drinking beer.) In the process you’ll discover numerous holy “syllables”, which are then used to cast a variety of magic spells. 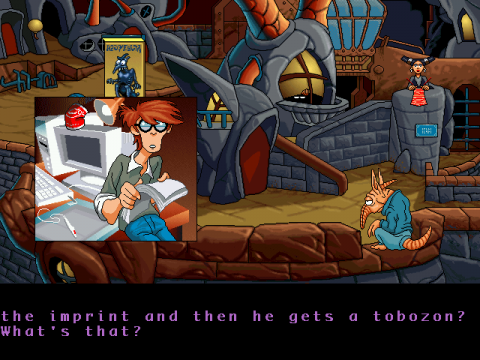 You’ll also need to track down the hidden location of the Master, who teaches Woodruff a variety of necessary skills involving his ears, nose and other body parts. The Adventures of Woodruff and the Schnibble is difficult to play, and even more difficult to comprehend. The humor is much different from any of Sierra’s or LucasArts’ games, and the flagrant silliness contrasted with the grim overtones of the story make for a very interesting experience, to say the least.